A perennial with male and female plants, Nettle (Urtica dioica) grows up to 4 feet tall and has toothed, pointed leaves that sting when touched. The sting causes a burning sensation. This is because every hair consists of a sharp, hollow spine that breaks off simply, allowing the liquid within, formic acid, to be released into the object leading to the damage. 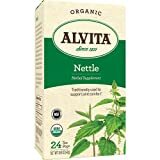 In spite of its stinging, Nettles are of substantial use in numerous approaches, which includes culinary they incorporate vitamins A and C, iron and a range of other minerals. The younger shoots can also be boiled as a vegetable. Nettle fibers can be spun into rope and created into cloth. Cosmetically, Nettle is a great cleanser, specially for oily skin. As a tea, Nettle might be taken hot or cold and a lot of choose it sweetened and flavored with lemon.